See also The GNU Calc Reference Card. Say we have two columns of data in a GNU Emacs buffer, and we want to plot them as abscissae and ordinates; e.g. Select the rectangle: with the cursor at the top-left, hit C-SPC to set-mark-command then move cursor to the bottom-right. Then M-# r to calc-dispatch and ‘grab rectangle from a buffer’. In Calc, hit v t to calc-transpose, then v u to calc-unpack the data into two row vectors. 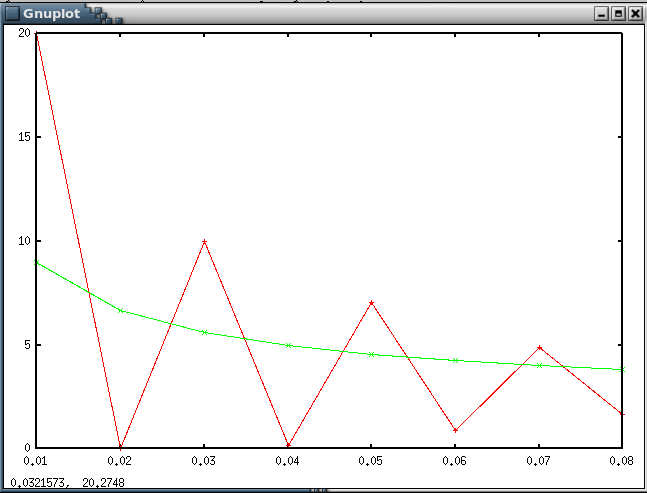 Finally hit g f to calc-graph-fast. This should produce something like the following graph. If you want a grid, issue g g (calc-graph-grid) and g p (calc-graph-plot). To graph equally spaced ordinates, the abscissae aren't required: just put 0 or 1 in the second position on the GNU Calc stack before issuing calc-graph-fast. Say we have a second set of ordinates in a third column; e.g. Grab, transpose, and unpack the data as before, but then do M-2 g f to use 2 lots of ordinates. This produces the following graph. 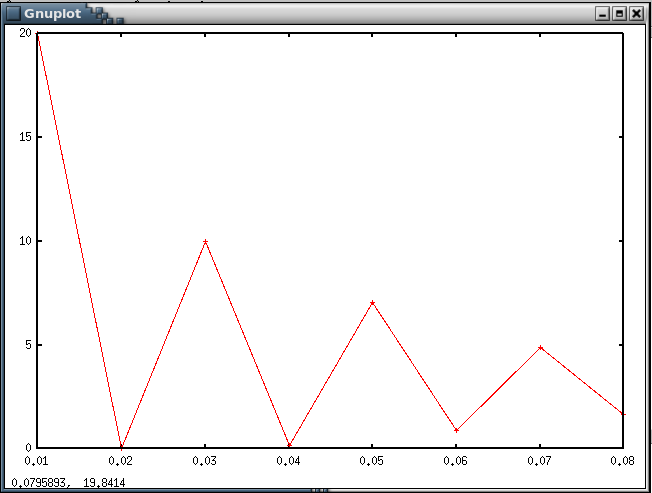 Similarly, for n+1 columns of data representing n sets of ordinates, hit M-n before calling calc-graph-fast. Calc is slow if the data sets are large. Last modified Tue. 15 Jan. 2008 by Geordie McBain.